Dehydration can seriously affect your horse's health & performance. Horse Quencher is perfect to use at competitions, when you need to ensure your horse is drinking enough to avoid dehydration & be performing at their very best. Horse Quencher is also great to use with electrolytes, as when electrolytes are given by themselves, they can be toxic, so they should always be followed up with water. Horse Quencher is very popular with top riders across all disciplines. Horse Quencher is also great to encourage sick horses to drink; often when horses are unwell, they lose their desire to drink, even though it is so important for their health. For example in horses who are recovering from surgery or a virus. It is also very useful in horses who are prone to impaction colic, which often occurs during cold weather, when they don't drink enough. 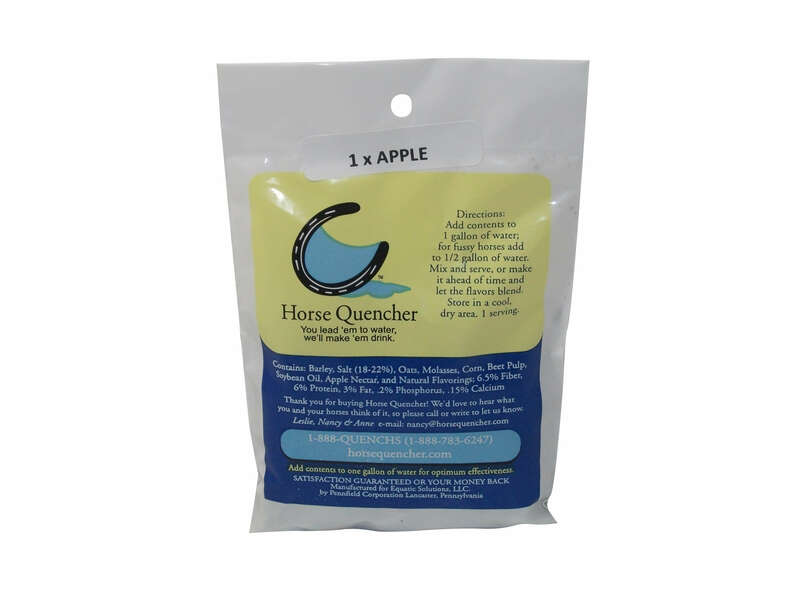 Horse Quencher comes in Apple flavour & a variety of serving sizes. 1 sachet is 1 serving of Horse Quencher. We recommend introducing Horse Quencher at home, in a calm environment so that your horse is used to the product before using it in a more difficult situation, like at an event or during illness.